Remember those infamous self-promoting Google Tips that were later pulled down following intense criticism from bloggers. Google was accused of promoting their own products like Google Calendar, Blogger and Picasa in organic search results for common queries like blog, calendar, etc. Now they seem to be doing something similar for Google Checkout which faces stiff competition from Paypal owned by eBay.com. As you have probably noticed, Google is now adding a small shopping cart icon next to ads that link to sites where shoppers can buy via Google Checkout. » Icons are actually images and it's a well known fact that images placed next to ads perform better because they help grab the user's attention. 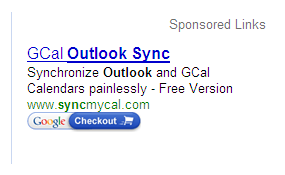 If a site has three Google Ads in sequence, the one using Checkout icon will probably outperform others. » Google says that the icon is shown only for advertisers that use Checkout. Then why is the shopping cart icon displayed next to ads of Google Analytics ? Isn't that a free service. » Google is also adding wide badges and text descriptions to ads displayed on Google Search results pages to "help shoppers more easily identify Google Checkout merchants". Isn't the Adsense system unfair to merchants who use PayPal or some other payment option. Probably yes.